Choosing which Bible translation to use is an important decision. The books of the Bible, being translated from the manuscript copies of the original inspired texts, contain the special revelation that God has given us. This revelation is precious and should be guarded. A good translation helps to ensure that we are getting the best possible representation of it. What makes for a good translation? I believe the two most important factors are faithfulness to the copies of the original texts and readability. Choosing words that most closely match the meaning of the original helps to insure we are reading what God intended for us to read. Making sure those same words are commonly understood and are set in a logical and flowing sequence produces a translation that can be read and understood by a large audience. Bibles differ in how closely they adhere to these two concepts. In doing so, they tend to fall into one of three categories, word-for-word translations, thought-for-thought translations, and paraphrases. The ones that seek to render the original words and meaning most literally are the word-for-word translations. This approach helps to maximize accuracy in representing the original texts. For that reason, I believe they are the best choice. It is important for us to stay as close as possible to the original. God’s word is too valuable to minimize accuracy. Thought-for-thought translations move away from a literal approach and aim to capture the meaning of the words and phrases of the original and present them in a way that reads well. Paraphrases do what their name suggests. They paraphrase verses and are written to be easier to read and understand than word-for-word and thought-for-thought translations. While they may shed light on the meaning of the text, care should be taken when using them. Paraphrases sometimes change the original meaning too much. If you do choose to use a paraphrase, I recommend using it alongside of a more accurate translation. We cannot rightly handle the word of truth (2 Timothy 2:15) if what we are reading is too different from what was originally written. There is a modern Bible version that I believe is in a class all by itself. It has the distinction of always being the furthest away from the word-for-word side of every chart I’ve seen that graphs Bible versions in order from word-for-word to paraphrase. (Follow this link to see a collection of Bible translation comparison charts.) The version that I am referring to is The Message by Eugene H. Peterson published by NavPress. The New Testament portion of The Message was released in 1993. Other portions followed later. It is a paraphrase and was not meant to be a word-for-word translation. Differences are to be expected, but there are many that concern me. My concerns about The Message started years ago when I first came across it. Since then I have continued to compare it to other versions. Whenever I do, I find more reasons to be concerned. I address some of them below, in my post A Creative But Inaccurate Message, and on my page The Message – Verse Comparisons. If you use or are considering using The Message, I encourage you to carefully compare it to other English versions that are known for being more accurate. I have read why Mr. Peterson wrote The Message. On biblegateway.com he is quoted as saying that he “hoped to bring the New Testament to life for two different types of people: those who hadn’t read the Bible because it seemed too distant and irrelevant and those who had read the Bible so much that it had become ‘old hat.”¹ His intentions may have been good, but I’m afraid the end product is not. In The Message, a significant trade off is made between engaging readers and fidelity to the word of God. Honestly, I have never been a fan of paraphrases because I want to read a Bible that is as close to the original texts as possible. As I wrote above, I believe word-for-word translations are the best choice. When we move away from them, the distance from the original meaning widens. In worst case scenarios, doctrine disappears when wording is significantly changed. The Message deviates from the original more than any other Bible I have seen. The differences are damaging to various aspects of Christian doctrine and living. I hope this analysis serves to increase awareness that The Message has significant problems. There are important doctrines in the Christian faith. These doctrines are intrinsically linked to the words of the Bible. If we change the wording too much, it becomes a lot more difficult and in some cases impossible to see those doctrines. This is exactly what happens in The Message. One doctrine that I feel is at risk in The Message is the doctrine of justification. Justification is at the heart of our salvation and speaks to how God see us through Christ.. Here are a couple of Protestant explanations of the doctrine. Answer. Justification is an act of God’s free grace,wherein he pardoneth all our sins,and accepteth us as righteous in His sight, only for the righteousness of Christ imputed to us, and received by faith alone. As you can see, justification is a very important doctrine. Making sure that readers of the Bible can clearly see this doctrine should be a vital concern to translators. It is seen in word-for-word translations because the Greek words that speak of justification are rendered accurately and consistently as justification and justified. The verses that they appear in and the context around them help us shape our understanding of how God sees us through Jesus. I did a search for the words justification and justified (when on topic) in the KJV, NASB, ESV, and The Message. Here are the results from the New Testament. These results were shocking. The words simply do not appear in the New Testament. Does this mean that this important doctrine would be lost to people reading The Message? That would depend on what words are used in their place. If the words used mean the same thing as the original Greek words then the integrity of the verses could possibly hold up. If the words are also used consistently then the reader could link the verses together to get the full picture of our justification. Choosing words to best represent the meaning of the Greek is important. The New Testament authors were inspired by God and the words they used should be respected. Before I list the words that were used in The Message for justification and justified, here are the Greek words and their definitions from Strong’s Exhaustive Concordance. G1345 dikaiōma From G1344; an equitable deed; by implication a statute or decision: – judgment, justification, ordinance, righteousness. G1344 dikaioō – to render (that is, show or regard as) just or innocent: – free, justify (-ier), be righteous. So what words were used as replacements? Here is a sample of what I found. From this sampling it does not appear that the replacement words do a good job of staying close to the meaning of the original Greek. Is justification a wonderful life sentence, getting in step with God and all others, a fresh start, or the place we set out for? Also there is little consistency in the wording. If you look up all the verses you will find some continuity in the expression “right with God”, but the rest vary. How can one see the doctrine of justification when it is represented in significantly different ways? 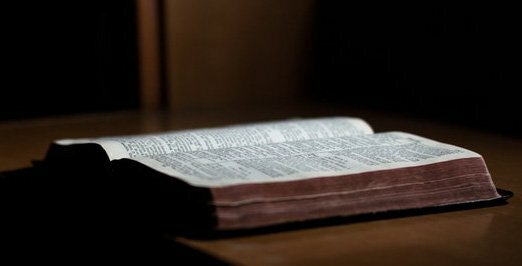 The expression “Let Scripture interpret Scripture.” exists for a reason. We compare verses with other versus to get the full picture of what God’s word says. That would be very hard with The Message. Important ideas like justification are represented inconsistently and with words that stray too far from the meaning of the original. As mentioned earlier, I understand that Mr. Peterson hoped to engage new readers and rekindle the passion of veterans of the Bible. Unfortunately, because the words in The Message are so different from the original, his approach backfires; and his readers are actually cut off from the Bible. When they read The Message, they are not holding what should rightly be called a Bible in their hands. Instead it is a colorful retelling that takes great liberties. I do not think the words justification and justified are terribly off-putting or too difficult to understand for newcomers, nor do I think they need be boring for veterans. Serving a smorgasbord of words for the same concept to an unsaved person who is seeking the Lord will not bring clarity. It may make the “message” more entertaining or palatable, but it will also prevent the gospel from being shared and dull the sword of the Spirit. Allowing veterans to drink artificially colored milk in the hope of keeping them engaged instead of driving them forward to grade A meat will make them malnourished and weak. This is not good for them, the church, or for those who need to hear the gospel through them. It is not just the words justification and justified that are important, it is also the words around them. Because of the inconsistency in the rendering of the Greek into English, more damage has been done to the gospel because important concepts concerning justification are vague or gone completely. There is a widely loved and important phase in the Bible concerning justification. It is “justified by faith.” It appears four times in the NASB and ESV and three times in the KJV. Does it appear in The Message? Three of the four verses are in the above chart. Let’s take another look at them and add the fourth verse. The word faith does appear in one of the verses, and one might argue that “trusting” is not a bad alternative. But what of “get in step with God and all others by letting him set the pace”; or … sorry, I just can’t see faith in Galatians 3: 24. The exclusion of faith from these verses should concern anyone who cherishes the truth and beauty of what God has done for us in Christ. Without it, this glorious truth is veiled. Please entertain a bit of fancy here. Martin Luther came to a very important conclusions about being justified by faith and righteousness while reading and teaching the word. How differently the Reformation would have looked if he had been reading The Message. Christians today ought to have the same chance to see what he saw. Justification is not the only doctrine that is in jeopardy in The Message. I also looked for sanctification in regards to the holiness of the believer. Again from the Westminster Shorter Catechism. Answer. Sanctification is the work of God’s free grace [a], whereby we are renewed in the whole man after the image of God [b], and are enabled more and more to die unto sin, and live unto righteousness. Sanctification is a term many Christians have heard. It is often described as a process in which we become more like Christ. We become more holy in our thoughts, words, and actions as we are led by the Holy Spirit to walk in a manner worthy of our calling. Here is the Greek word for sanctified. G37 hagiazō From G40; to make holy, that is, (ceremonially) purify or consecrate; (mentally) to venerate: – hallow, be holy, sanctify. Are the words sanctification and sanctified in The Message? Here are my search results from the New Testament. Zero results again. The expressions that are used in place of these words are not consistent, though some do contain the idea of being set apart and consecrated. The reader may be able to arrive at some sense of sanctification, but it would be very difficult to combine relevant verses together. Not being able to do that precludes them from seeing the concept of sanctification in multiple settings. Being able to see the concept in multiples settings often increases understanding. The absence of the words sanctification and sanctified from The Message is a loss for all who read it and for Christianity in general. Sanctification is a precious doctrine that can be explained even though it is a big word. It should be retained for each successive generation. In his article Sanctification: So Why the Long Word? David Mathis quotes John Piper explaining why he wishes to retain and teach the word sanctification in spite of it being a foreign word in our culture. Mr. Piper says the world needs this “church” word. I agree, yet how much more the church needs it! If you’re curious, you may like to look up other important terms. Look to see how they have been replaced and what has been done to the context that they appear in. A couple of suggestions are righteousness and submission as it relates to wives. 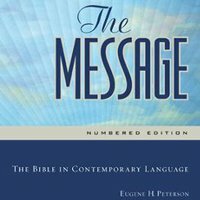 You may find it interesting to search The Message for “the message.” It almost completely replaces “gospel” which only appears once in The Message. 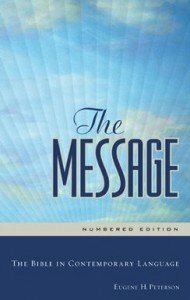 It appears often as “the Message” and therefore reads like a proper noun because of the capital M. It is reckless to even suggest that the book The Message is what was preached and what must be believed. While writing this article I discovered that there are other modern Bibles and paraphrases that do not use the four words that I have covered above for the concepts of justification and sanctification in the New Testament. Except for one occasion, they do not appear in the NLT, CEB, NIrV, LB, CEV, or God’s Word. I did at least find words that were for the most part closer in meaning to the original and that appeared more consistently. It just confirmed my belief that The Message is in a class all by itself. The differences found in The Message that I highlighted here are just a small sampling of the problems I have seen. However, they alone would be enough reason for me to refrain from using it or recommending it. I am happy to report that Mr. Peterson does at least recommend a limited use of The Message. The following is from Michelle Bearden’s article “Eugene Peterson: Getting Out the Message” in Publishers Weekly. It is good that Mr. Peterson sets limits and wants readers to “get weaned from it”, yet it is disappointing that he thinks The Message is good for newcomers. What doctrines and important truths about God are they missing? Many pastors work hard to preach well and explain the meaning of the Bible. I have seen many stress the importance of the Hebrew and Greek words on which it is based. That along with my own desire to be connected to the original text as much as possible prohibits me from being able to approve of a Bible that strays so far from the original. Unfortunately, like Mr. Peterson, I have seen some pastors do that. I much prefer they seek always to hold fast to that which God inspired for his people and promote Bible versions that seek to be true to it. Those versions bring God’s word to us in the most accurate way that we can have today. I want that for all readers of the Bible, even new ones.